The Narendra Modi government has cleared a $1.2Bln proposal to purchase 32 Dhruv helicopters from government-owned HAL. The Indian Navy and the Indian Coast Guard will get 16 choppers each. NEW DELHI (Sputnik) — The Indian Coast Guard has signed up for performance based logistics support for five years for the 16 helicopters it is to get. The contract includes a penalty if the performance doesn't meet the promise made by HAL. "The Performance Based Logistics is the purchase of logistics support as an integrated, affordable, performance package designed to optimize system readiness and meet performance goals for the product through long-term support arrangements with clear lines of authority and responsibility", said T. Suvarna Raju, Chairman and Managing Director, Hindustan Aeronautics Limited (HAL). The helicopters are expected to be delivered beginning 2020. The Navy has asked for installing low-frequency SONAR, developed by the Defense Research and Development Organization, for its 16 helicopters. 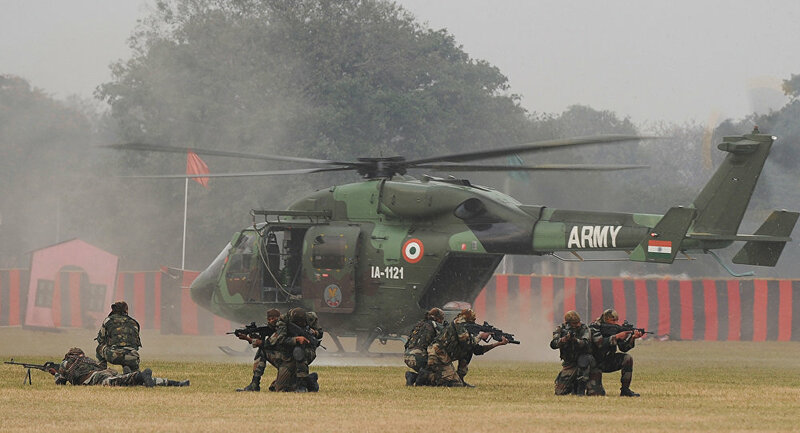 Despite HAL claims, 14 military and two civilian Dhruv helicopters have been involved in accidents, of which 11 occurred in India and five in Ecuador since 2002. The government has maintained that out of the 16 accidents, 12 occurred due to human error and environmental factors and the remaining due to technical reasons. The multi-role, multi-mission Dhruv is in 5.5-ton weight class and meets Federal Aviation Regulation specifications. It is an all-weather helicopter that can carry 10-16 people at heights of 10,000 feet.